Good News. We’re proud to announce that Cliscep regular Brad Keyes has just been named Climate Blogger of the Year at Tom Fuller’s site, the Lukewarmer’s Way, beating two other favourites of ours, José Duarte and Fabius Maximus. 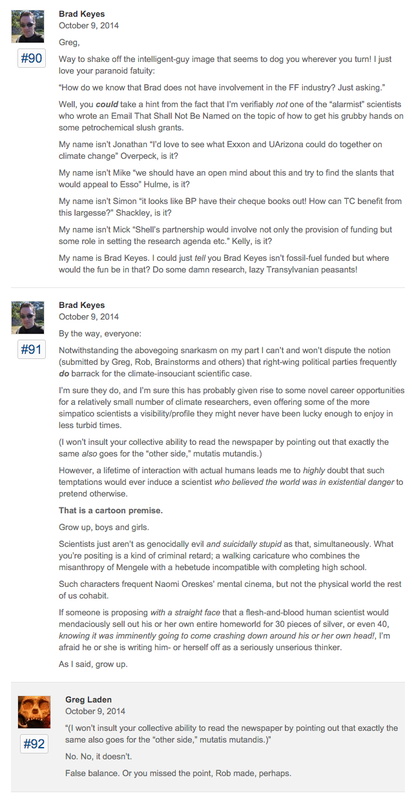 Tom correctly points out that Brad is “without doubt the funniest blogger in the climate world”. He could have added that he is one of the funniest (and the least politically correct) writers around, period. When he’s not writing paeans to Gore, Oreskes, Pachauri & co here, he’s busy shafting trolls elsewhere, most recently and effectively here. If anyone has a favourite Bradism they’d like to share, please feel free to post it here. Guys, you’re too kind. Thank you. That, and the entire post before it. Congratulations to Brad on this well-deserved award. One of my favourites was the series at Climate Nuremberg on the mysterious disappearance of the Scared Scientists, starting with the beginnings of the Police investigation, then the newspaper reports with interviews with their 92-year old grannies, then inevitably the opinion of Lewandowsky (with animated gifs), and finally Dan Kahan. Actually, no—thanks to the performances by Paul, Shub, Geoff and others who’ve mastered the art of hiding their hate it’s still well worth reading. I saved the comments from a browser window last refreshed sometime this morning, before the Bonfire of the Bradcomments. What an apt metaphor for your entire “career” in the climate debate. Dear Lewandowsky and collaborator (whose name I’ve forgotten), do yourselves a favor and wake up to the fact that THE MIDDLE AGES ARE OVER. You can either be priests or scientists. Not both. I wonder if the peer reviewers are from the advisory panel? Zoology, Oxford, PhD in ecological genetics, Cambridge. He spent three years as Media and Communications Officer at the UK National Oceanography Centre in Southampton, which is a Tyndall Centre, http://www.tyndall.ac.uk/Partner-Institutions/University-Southampton. “Quantitative economist” PhD in environmental economics. Prior to joining Nature Climate Change, Monica worked with WWF-UK developing research on sustainable consumption. Before that, she was a senior lecturer at the Crichton Carbon Centre in Scotland. PhD in trace element biogeochemistry and first class Honours in Antarctic Studies from the University of Tasmania, Australia. Prior to joining Nature Climate Change, Bronwyn was a postdoctoral researcher at the University of Southampton, UK, (Tyndall again) and European Institute for Marine Studies, Brest, France. Before joining Nature Climate Change, UK Climate Impacts Programme (UKCIP) at Oxford ECI, (Diana Liverman, Myles Allen, Malte Meinshausen), Degree in environmental science and Masters in global environmental change, both at the University of Plymouth. Suraje Dessai is Professor of Climate Change Adaptation at the Sustainability Research Institute in the School of Earth and Environment at Leeds University. Member of the Economic and Social Research Council, (ESRC) Centre for Climate Change Economics and Policy (CCCEP). This is a joint venture with Stern’s LSE Grantham outfit and ESRC. The management team includes Simon Dietz and Sam Fankhauser of the Grantham Institute, along with good old Bob Ward. The advisory group has Peter Hoeppe of Munich Re and Corinne Le Quere, Director of Tyndall. Fankhauser is on the UK Climate Change Committee. Dessai is a Lead Author on the chapter “Foundations for Decision-making” for the IPCC Working Group 2 (Impacts, Adaptation and Vulnerability) Fifth Assessment Report and also serves on the IPCC’s Task Group on Data and Scenario Support for Impact and Climate Analysis (TGICA). Other names include Riley E. Dunlap http://www.scholarsstrategynetwork.org/scholar-profile/251, co-author of “The Climate Change Denial Campaign” and “Organised Climate Change Denial”. Saleemul Huq, IPCC lead author of the chapter on Adaptation and Sustainable Development in AR3 and was CLA of ‘Interrelationships between adaptation and mitigation’ in the AR4. Formerly director of Oxford Environmental Change Institute, (Myles Allen), Co-Director, Institute for the Environment, University of Arizona. She studied under Stephen Schneider at NCAR. Crispin Tickell is on the Arizona U advisory board. He was a good friend of the late Maurice Strong,. Major manipulator behind the scenes in government circles on climate. University of Melbourne, and Potsdam Institute. Colleague of Stefan Rahmstorf at Potsdam, Former Greenpeace and Climate Action Network. Riley Dunlap! That’s quite a find. Back in the seventies he invented a thing called the New Ecological Paradigm, a battery of talking points which was meant to provoke a Kuhnian paradigm shift in our civilisation. Out with fuddy duddy old enlightenment rationalism, in with Eco-think, founded on a consensus around such statements as “We live on a fragile planet”. His source for this New Paradigm was a book of eco-political ramblings by Paul Ehrlich and Dennis Pirages. Dig anywhere in the austere world of peer reviewed science and just below the surface you find sixties hippy flower power. Probably the ultimate source for the entire structure of Environmental Science is to be found in back numbers of Rolling Stone.